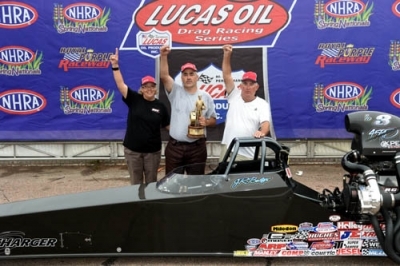 JR TOOK HIS NEW 2016 MILLER DRAGSTER TO THE WINNERS CIRCLE TO DEFEND AND CAPTURE THE MELLO YELLOW SPRING NATIONALS TITLE IN TD IN HOUSTON, TX. OUR CONGRATULATIONS GO OUT TO HIM AND HIS TEAM !! Weather conditions: air temperature 77 degrees, relative humidity 80 percent, barometer 29.76 inches, adjusted altitude 2,383 feet, track temperature 94 degrees.